Robert Pattinson’s Spanish Colonial home looks very “Old Hollywood” to me, but updated for a new generation. The walled and gated estate was one of the first private residences built in the Hills above Los Feliz back in 1922. It’s on the market for $6.75 million — take a look! The house has 4,000 square feet with 3 bedrooms and 3 full baths. 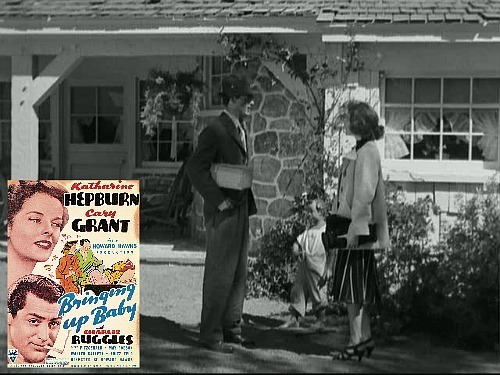 I love that they chose to show a scene from the classic Katharine Hepburn screwball comedy Bringing Up Baby. I featured her country home in Connecticut from the movie here. Love that one! Pattinson purchased the home for $6.275 in 2011 from Kareem-Abdul Jabbar and lived here with his Twilight co-star and girlfriend Kristen Stewart. After they broke up earlier this year, he decided to sell. Rumor has it that he wants a fresh start. You may recall that immediately after the split he took refuge at Reese Witherspoon’s Ojai retreat known as Libbey Ranch, which she later put on the market, as well. The grounds and gardens are gorgeous. For more photos and information, check the listing by David Gray of Partners Trust Beverly Hills and the Trulia blog. That is a beautiful old Hollywood home! Please tell me that is staged and these two young kids did not have this kind of taste? lol Just kidding but the home and that garden is beautiful! I know what you mean! I’d love to know who the designer was. So what are we swooning over exactly, eh??? He is good looking, for sure, and the house is beautiful, although I much prefer the older sections. Lovely courtyard, and those ceilings are amazing. I would change the decor to be more personal. This is definitely staged or decorated by a professional – a little too hotel-y for my taste. Beautiful home, but I find the décor a bit stuffy and contrived. It doesn’t look terribly comfortable to me. The grounds, as well, are lovely but too formal for my taste. I would be surprised if this is how the place looked when Robert and Kristin lived here. I don’t usually go for this style either in house or decor, but I really like everything about it. It totally looks old Hollywood and I love all the detail, especially the tile work. Also seems like a reasonable price considering it’s lineage and location. I wonder what other famous people have taken up residence there. In this article, it’s interesting to look at the ariel photo (4th down). The back of the property is massive! What’s so amazing are the details in the craftsmanship. You just don’t see such woodwork, tile work, and attention to detail in most homes. Worth every penny. I wonder why Kareem sold it. I have to say I was surprised, too, Gwen! How very beautiful. I love the wood beam ceilings, the shutters, and oh my (*swoon*) that balcony!….a wonderful place to sit in the evenings I bet. I didn’t think this was my style until I saw this house. It looks authentic and elegant. The shower carrera marble mixed with mosaic tilework is modern with an appropriate homage to the style of the home. I am wondering who the designer was too. Love the doors in the kitchen and the upstairs landing. Great fun post. Thank you. I really liked the decor. It’s masculine, but not overly so. I could live there without changing much. Very cool house. There’s nothing like a 1920’s Spanish Colonial with all the details and craftsmanship. I do wonder about the furnishings and how much of it was staged. Seems like a good buy to me – as if I’d know! I wonder if Joni has seen this – ha! Check out today’s post: https://cotedetexas.blogspot.com/ Joni really outdid herself! Julia beats me to it every time!!!!! Just once I want to publish a house before Julia does. ha!!!! I didn’t even notice the movie on the TV screen. I am sooooooooo in love with this house. Addicted to iit!!! I loved every bit of the house. The rooms with their gorgeous beamed or barreled ceilings, the tile work, the elegant wrought iron. I loved the logia with its view of the spiral thingie in the garden. The decor (furniture, drapes, accessories) is ghastly. I think this might be my favorite celebrity house ever!! Love everything! I feel like we were transported in time back to the golden age of Hollywood but still modern and of this time period. if that make any sense…..
That’s how it struck me, too, Erin. I know what you mean! You can feel the history of the house in its decor yet comfy and inviting! Love it. Bet he was very happy there till…That was a tough ending. Wishing him well especially since I like his home so much. Insanely lovely! Normally I don’t spend too much time looking up at ceilings, but this house was the exception! Beautiful barrel vaults and painted beams! I love this house! I agree with everyone else, though and would be surprised if this is how it looked when Rob actually lived there. Then again, (sadly) I’ve seen enough interviews with him to know he doesn’t stay in one place too long and that he stays in a lot of hotels. So maybe he never really spent much time there… who knows! But it looks like a very liveable home. LOVE! Even though the kitchen is simpler then the rest of the house, I love it! It was what my dream kitchen would look like (minus that chandelier). Bright and airy with a big door leading outside. Love this house…..Looks comfortable to me. Pretty stairway too. Wow. That is simply a perfect home. I cannot imagine twenty year olds living there. This is the style of house where I can appreciate the detail, admire the architecture, delight in the ceilings and the tile work, yet never be able to live in myself. My personality requires completely different aesthetic sensibilities to call it home. I hope the prospective buyers don’t mind me in their way when they come to gawk. I’ll just be cooking in that amazing kitchen. And then curled up on that red sofa in the library………. I always heard the old saying “You can’t judge a book by its cover” but in this case “You can’t judge a house by its owner”. Just a perfect house in every way. Now I’m swooning. I love the beams. I love the chunky cool furniture. What a great place. What a gorgeous house…. inside & out. The only problem I would have is avoiding getting dizzy & cracking my head in that shower! I simply couldn’t deal with that tile. Those ceilings are beautiful. I actually like this house. Not too overdone. I just wish they wouldn’t have changed out a few of the light fixtures. They do not fit the period at all. The ones that were not changed out look perfect in this house. I doubt that any of those furnishings belong to the actor. It is definitely staged. Love the outside too. I love the beautiful coloured tiles in the shower and the stunning gardens. Nice to see a house with an individual style and details that have stood the test of time. Thanks, Julia. Gee, you make a couple movies and can afford this for one person. I don’t think I would ever buy something this large even with millions, why do they all think they must? I doubt he is ever “home”. I saw on E! News that Jim Parsons recently bought this house for $6 million.